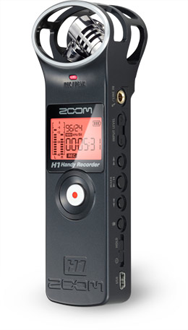 Weighing in at only 2 ounces, the H1 sports many of the features that set Zoom's products apart, such as the X/Y configuration of its microphones, which ensures the even recording of sounds with minimum cross-interference, long battery life and support for a wide variety of recording formats that can deliver up to 50 hours of recording time with CD-like quality. Like many of its predecessors, the H1 is priced to sell: $99 will get you the base package, which includes an AA battery and a 2GB microSHDC memory card. (The device can accommodate up to 32GB.) The recorder features a USB port, through which it can be connected to a computer for power or for use as an external microphone. In addition to the smaller form factor, the Handy Recorder comes with a brand new user interface that foregoes the traditional menu-based approach in favour of a series of on-board buttons that can be accessed with the thumb. The base H1 model will be available on July 30. An optional accessory package, which includes a USB AC adapter complete with cable, an adjustable tripod stand, padded case, clip adapter and afro windscreen will also be available for an additional $25 at the device's launch.